Accessible by boat Holy Island or Inis Cealtra containing approximately twenty hectares is situated on Lough Derg the largest lake on the Shannon. It lies at the mouth of Scariff Bay an inlet of Lough Derg which gives its name to an unpleasant breeze known to fishermen in particular as the 'Scariff Breeze'. Mountshannon is the nearest village to the island which is placed in the midst of some of the most beautiful scenery in the whole of Ireland.Prior to 1849 it formed part of Co. Clare but in that year it was transferred to Co.Galway. In 1899 soon after the passing of The Local Government Act it was restored to Clare. Ecclesiastically it belongs to the Diocese of Killaloe. It has a fine round tower but the top is missing and the ruins of several small churches and cells as well as part of 4 high crosses and a holy well. The cemetery on this island is still in use, the coffins being transported from the Clare side in small boats. A pair of white tailed eagles has been confirmed nesting near Mountshannon, Co. Clare. The breeding pair, which were released in Killarney National Park, Co. Kerry as part of an ongoing reintroduction project coordinated by the Golden Eagle Trust, settled in the Mountshannon area in early 2011. This is the first confirmed nesting attempt since the reintroduction programme began and the first documented Irish nesting record for this huge bird of prey in over 100 years �This is a truly momentous event�, said Dr. Allan Mee, project manager for the White Tailed Eagle reintroduction project. �It seems a long time since we collected these birds as chicks from nests in the wild in Norway and to see them now nesting in the wild themselves in Ireland is the day we have all been waiting for�. The breeding pair consists of a four year old male and a three year old female, collected in 2008 and 2009 respectively from the island of Fr�ya off the west coast of Norway. White-tailed Eagles are fully mature and usually begin to breed at five years of age, but in Scotland reintroduced birds have occasionally bred as early as three. �We had hopes that this pair might try and build a nest but because the birds are relatively young we really didn�t expect them to breed�, Dr. Mee added. Over the past four years White-tailed Eagles released in Killarney have dispersed throughout Ireland and beyond. 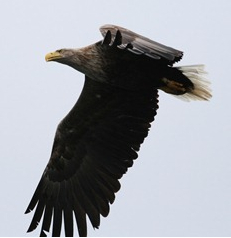 Many eagles have been reported from Northern Ireland and at least six birds have travelled to Scotland. One male that spent 8 months away from Kerry in 2009 travelled over 2,000 kilometres to the Orkney Islands off the north coast of Scotland before returning to Kerry, where he paired up with a female in the south of the county in 2011. Immature White-tailed Eagles often disperse over a wide area but once birds begin to mature and pair up at 4-5 years old they establish territories along the coast and at inland lakes where they remain resident throughout their lifetime. �The odds are stacked against young first-time breeders,� cautioned Dr. Mee. �They have no experience of nest-building, mating and caring for eggs and young. They have to get everything right to succeed. But this pair has impressed us so far. �Once they settled down to incubate the clutch of eggs both parents were very diligent. The nest has only very rarely been left unattended and birds have been quick to spot potential dangers such as the presence of hooded crows which might predate the eggs. Since the eggs take some six weeks to hatch they still have a long way to go. But so far so good�. Located in "The Snug" Main Street Mountshannon. Market takes place from 11am til 3pm every Saturday. The most natural attraction in Ireland is located only 1,5 hour drive from Mountshannon. 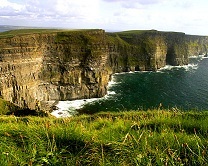 It is located on the northwest coast of County Clare only 1h 15 min drive from Mountshannon. 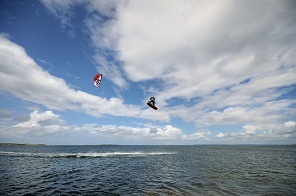 It is a great place for surfing, kitesurfing and windsurfing.